Assisted by our expert professionals and their industry expertise, we are able to offer an exclusive array of High Voltage Probe. Our high voltage probe is available from us in numerous specifications to choose from. 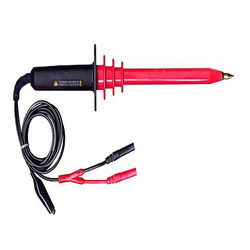 This high voltage probe is used to measure both AC & DC voltage with your multimeter. The high voltage probe offered by us is designed by using top quality of material & leading techniques in accordance with the set norms. Looking for High Voltage Probe ?